Naan is East Indian flatbread that is traditionally baked in a tandoor oven. Naan is soft and puffy and has a slightly smoky flavor. It can be made at home, or bought at many grocery stores. For this recipe, I buy whole wheat naan at the store. 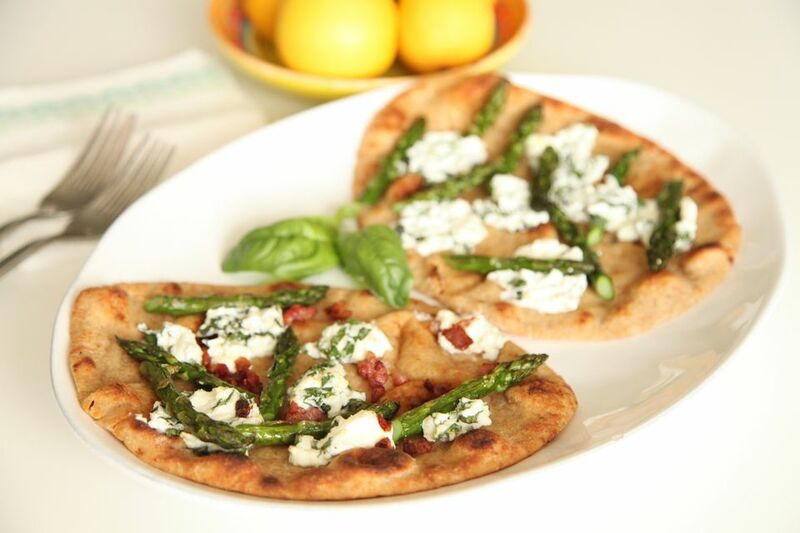 In this recipe, naan "pizza" is topped with asparagus, pancetta and goat cheese mashed with lemon and basil. The combination of asparagus, goat cheese and pancetta is also great on a regular pizza crust. Toss asparagus with olive oil and season lightly with salt and pepper. Line up in one layer on a rimmed baking sheet. Broil the asparagus 6 to 8 minutes until tender and crispy on the tips, being careful not to let it burn. Shake the pan once or twice while the asparagus cooks. When the asparagus cools, cut each stalk into thirds. In a skillet, cook pancetta until crispy. Set aside. Gently mash together goat cheese, lemon zest and basil. Set aside. If possible, lower the broiler heat to low. Arrange naan on a sheet pan. Brush lightly with olive oil. Drop spoonfuls of goat cheese on top of each piece of naan, or evenly spread goat cheese on top of the naan. Lay asparagus and pancetta out evenly on the flatbreads. Sprinkle black pepper or red pepper flakes on top, if desired. Put under the broiler until the naan and goat cheese are warm and soft, about 3 minutes. This naan pizza tastes best when warm, but can also be eaten at room temperature. Pancetta is essentially Italian bacon. The fatty pork belly is cured with salt and spices and rolled into a thick roll. Unlike bacon, pancetta is not smoked or sweetened. Pancetta is often sold in round slices at the deli counter (where you can specify how thick or thin you want it) or in tiny pieces that have been cut up for you (which is convenient for recipes like this). Pancetta should be cooked before eating. It can be cooked in a skillet, just like bacon, and then added to many different recipes. Pancetta can be used in place of bacon in any recipe. It's fantastic in pasta dishes, on pizza, over salads or tossed with sauteed greens or cooked vegetables.